Anishinaabe economist and writer Winona LaDuke identifies two types of economies, grounded in different ways of seeing. Speaking in Vancouver recently, she characterized one as an “extreme extractive economy” fed by exploitation of people and nature. The second is a “regenerative economy” based on an understanding of the land and our relationship to it. We now go to extremes to access fossil fuels. Hydraulic fracturing shatters bedrock to release previously inaccessible gas, requiring large amounts of water made so toxic through the process that it must be disposed of in deep wells. We extract bitumen from Alberta’s oilsands using techniques that emit more than twice as many greenhouse gases as average North American crudes. The Pembina Institute reports that 1.3 trillion litres of fluid tailings have accumulated in open ponds in Northern Alberta since oilsands operations started in 1967. Human innovation has made it possible to extract less-accessible fossil fuels, and that’s provided jobs. But environmentally, socially and economically, this extreme behaviour can’t continue. We need new options. We must innovate and create jobs in a regenerative economy. Re-localization is happening in communities across Canada. The David Suzuki Foundation’s new, nationwide Charged Up program is collecting stories to help inspire people to take on renewable energy projects in their communities. In Oxford County, Ontario, local farmers, community members, the Six Nations of the Grand River and Prowind Canada launched Gunn’s Hill Wind Farm in 2016. It produces enough electricity to power almost 7,000 homes. Miranda Fuller, head of the Oxford Community Energy Co-operative, says the project helps connect people with the power they use and gives them a stake in their energy system. Its revenues are helping stabilize rural farm incomes, which helps protect local food systems and the community’s way of life. The project created about 200 jobs through development and construction. Some revenue goes to a community vibrancy fund and to student bursaries aimed at giving young people opportunities. Fuller makes an important observation: Community-led renewable energy projects provide a way for people to become active producers of energy rather than just passive ratepayers or consumers. Oxford County became the second local government in Canada, after Vancouver, to adopt a commitment to 100 per cent renewable energy by 2050. Gunn’s Hill makes up 15 per cent of Oxford County’s goal. Indigenous communities are also innovating and leading on renewables. Chief Patrick Michell of the Nlaka’pamux Nation in B.C. says meeting energy needs in concert with nature resonates with his nation’s values. Nlaka’pamux is working toward food and energy self-sufficiency. The Kanaka Bar Indian Band, one of 17 bands in the nation, has solar projects and has partnered with Innergex Renewable Energy and others on a run-of-river project to generate power and income. “What you do to the land, you do to yourself,” Michell says, quoting a traditional saying. He says his people have been food and energy self-sufficient for thousands of years, but recently his community has seen changes in weather patterns, water flows, precipitation, forest fires and ecosystems, often related to climate change. Kanaka Bar is building more energy-efficient homes and retrofitting existing houses to reduce energy needs. That costs money up front, but Patrick says he’s seen some of his neighbours’ energy bills plummet. Neighbouring communities are asking about Kanaka Bar’s experience, and Michell is happy to see the work rippling out. For him, these efforts represent a return to the land, to values that will help his community become more self-sufficient, vibrant and resilient. LaDuke says, “Keep your eye on where you’re going. Operate not out of a place of fear, but a place of hope.” Good advice for us all, as we celebrate the efforts of these communities and look to put the lessons they’ve learned into action across Canada. Let’s focus on hope. On climate solutions. On renewable energy led by communities like Oxford County, Kanaka Bar and others rising to the challenge to create a regenerative economy for everyone. 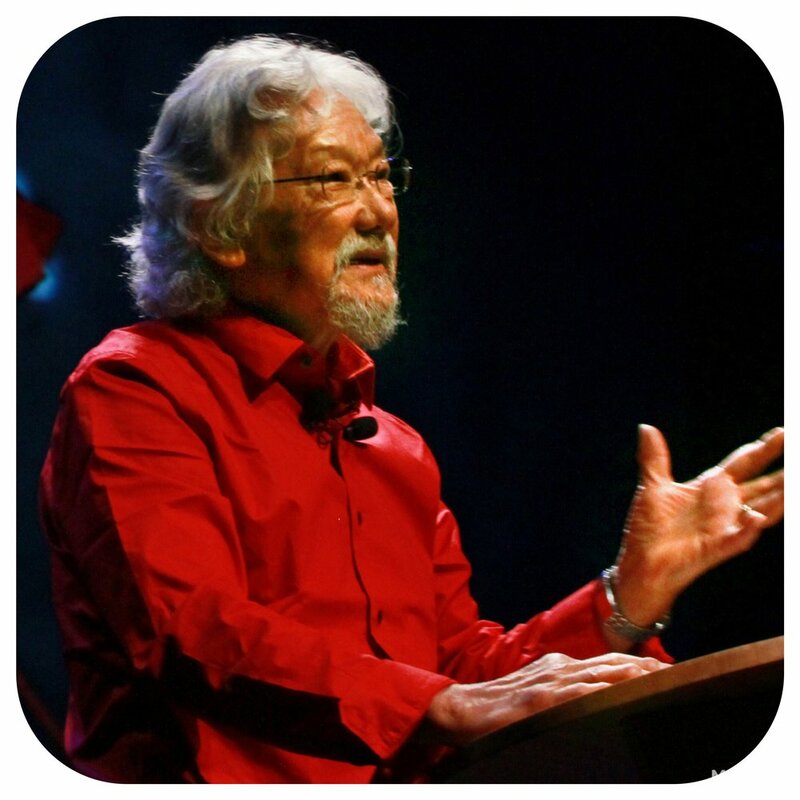 Dr. David Suzuki, Co-Founder of the David Suzuki Foundation, is an award- winning scientist, environmentalist and broadcaster. He is renowned for his radio and television programs that explain the complexities of the natural sciences in a compelling and easily understood way. Dr. Suzuki is also recognized as a world leader in sustainable ecology. He is now Professor Emeritus at UBC. Ever been to a Seedy Saturday (or Seedy Sunday)? If you have, you know that it is a great "feel-good" event -- all about seeds, and the hope, anticipation and potential contained in seeds -- and the coming of spring! At a Seedy Saturday, you will find seed swaps, regional seed vendors, workshops and information displays related to seeds and gardening. With the grower/vendors present at the event, you can ask questions about their production practices and get details about each variety -- for instance, planting dates, season length and recommended uses. I really enjoy meeting the growers -- the people behind the seed packages -- hearing stories about the seeds and feeling connected to the seed and gardening community. Just looking at the individuality of the seed packages, including beautiful hand-made ones, is a treat in itself for me. Yes, it's true -- I love going to Seedy Saturday! Or you can buy seeds from the regional seed companies that attend Seedy Saturdays -- a great way to obtain regionally-adapted seeds, including heritage varieties, and to support these small companies that are a key part of creating a more resilient local seed system. In eastern Ontario, where I live, there are several regional seed companies that attend Seedy Saturday events. The people operating these businesses are an important part of the sustainability and resilience of the local food and farm system. Without them, we are dependent on large, transnational companies that make seed decisions based on global market conditions, not on what grows well in any particular region. Based on my experience, go to Seedy Saturday with a list of what you need; otherwise, you will want to buy one of everything! Seedy Saturdays (or Seedy Sundays) are locally organized and held across Canada from February to mid-May; you can find details at the events link on Seeds of Diversity website -- www.seeds.ca/Seedy-Saturday Seeds of Diversity is a non-profit organization whose objectives are "to search out, preserve, perpetuate, study, and encourage the cultivation of heirloom and endangered varieties of food crops, and to educate the public about the importance of heirloom and endangered varieties of food crops and the need for their continued cultivation and preservation." I highly recommend The Seed Underground -- A Growing Revolution to Save Food, by Janisse Ray, Chelsea Green Publishing, 2012. Janisse Ray is a lifelong seed-saver and a poet; her book is a beautifully written series of stories about seeds, people who save them, and why we should all be saving seeds. Dianne Dowling is an organic dairy and beef farmer in the Kingston, Ontario, area and is active in food and farm organizations, including the National Farmers Union, the Food Policy Council for Kingston, Frontenac and Lennox-Addington and the Kingston Area Seed System Initiative (KASSI). What can be done about the past and present injustices dealt to Indigenous people in Canada? Among its 94 Calls to Action, the Truth and Reconciliation Commission of Canada called on federal, provincial, territorial and municipal governments to fully adopt and implement the United Nations Declaration on the Rights of Indigenous Peoples as the framework for reconciliation. It also called upon the Government of Canada to develop a national action plan, strategies and other concrete measures to achieve the goals of the United Nations Declaration on the Rights of Indigenous Peoples. What is this Declaration and what weight does it carry? It is an international human rights document adopted by the UN General Assembly in September 2007, after more than 20 years of negotiations. Its 46 articles affirm the collective and individual human rights of Indigenous peoples around the world on issues such as culture, identity, religion, language, health, education and community – issues that are central to the circumstances of Indigenous people in Canada. A UN General Assembly declaration is a document expressing political commitment on matters of global significance. It is not legally binding and is not signed or ratified by individual countries. Initially, Canada was one of four nations (along with Australia, New Zealand and the United States) that voted against the Declaration. However, in November 2010, Canada issued a statement of support endorsing the principles of the UN Declaration. In November 2015, the Prime Minister of Canada asked the Minister of Indigenous and Northern Affairs, and other ministers, in their mandate letters, to implement the Declaration. And in May 2016, the Minister of Indigenous and Northern Affairs announced Canada is now a full supporter of the Declaration. Despite these federal government statements of support and endorsement, Canada has not yet passed legislation implementing the United Nations Declaration on the Rights of Indigenous Peoples in Canada. In April 2016, Member of Parliament Romeo Saganash, (NDP critic for Intergovernmental Indigenous Affairs) tabled legislation (Bill C-262) to ensure that the laws of Canada respect the Declaration. Mr. Saganash, who spent 23 years at the UN negotiating the Declaration, says on his website that Bill C-262 provides a clear path to adopt and implement the Declaration in a “principled, systematic, cooperative, transparent and accountable” way. This is the second time that Mr. Saganash has tabled a bill calling for Canada to give the Declaration a legal basis in this country. When the Conservatives were in power, his earlier bill was supported by the NDP, Liberals and Greens. He has called on the Liberal government to support his bill, which is endorsed by Indigenous peoples and Canadians from coast to coast. If you agree with this effort to put legal teeth into the promises to Indigenous people in Canada, ask your MP to support Bill C-262 as it proceeds through Parliament. Go to nfu.ca for more information. It seems odd that a major U.S. government climate report released November 3, 2107 didn’t receive more media attention. But then, the main thing newsworthy about the Climate Science Special Report is that it was released at all, apparently without political interference. The report, released by 13 federal agencies under the direction of the National Oceanic and Atmospheric Administration, examines the available science. It was written by dozens of government and non- government scientists, reviewed by the independent National Academy of Sciences and approved by the National Economic Council. It concludes we are living in the warmest period in the history of modern civilization, with the last three years being the warmest on record, that we are seeing more “record-breaking, climate-related weather extremes” and that all the evidence points to human activities, “especially emissions of greenhouse gases,” as the main cause. “Thousands of studies conducted by researchers around the world have documented changes in surface, atmospheric, and oceanic temperatures; melting glaciers; diminishing snow cover; shrinking sea ice; rising sea levels; ocean acidification; and increasing atmospheric water vapour,” the reports says. It’s hard to imagine anyone could read this report, or read about it, and not be convinced we have an urgent problem and that failing to put everything we can into resolving it puts our survival at risk! And yet, the government overseeing this report is filled with people who reject climate science. The president himself has called it a hoax. He’s appointed climate science deniers to key positions, repealed and weakened environmental laws, had climate change references removed from the Environmental Protection Agency’s website and barred EPA scientists from presenting climate change reports. Many delegates at the UN Climate Conference underway in Bonn, Germany, have condemned Trump’s decision to pull the U.S. from the Paris Agreement. The official White House statement on the report was a rehash of tired climate science–denial talking points. White House spokesperson Raj Shah said, “The climate has changed and is always changing.” He then went on to cast doubt regarding theclimate’s sensitivity to greenhouse gas emissions. But the report also shows that, despite its apparent descent into a post-truth, anti-science dystopia, the United States still maintains sanity in some of its major institutions. Organizations like NASA, NOAA, the EPA and the Department of Defense, along with numerous non-governmental scientific institutions, are continuing to examine the real trends and risks of a planet warming rapidly because of human activity. It also shows we must do all we can to work toward solutions — economic, technological, philosophical and more — and to only support politicians who demonstrate the foresight, imagination and courage to take on this crisis with the force and intensity it merits. One frustration of studying and communicating about climate issues is knowing that so many solutions exist and are being developed, but that widespread denial of the problem prevents us from moving beyond outdated technologies and economic systems. That people who profit from those outdated technologies would do everything they can to sow doubt and confusion is not surprising. That a government elected to serve the people would reject the findings of its own scientists and researchers from around the world to the detriment of human health, the economy and the environment is an intergenerational crime. I’m often introduced as an environmentalist. I prefer to be called a father, grandfather, scientist or author, as these termsprovide insight into my motivation. Environmentalism isn’t a discipline or specialty like law, medicine, plumbing, music or art. It’s a way of seeing our place in the world and recognizing that our survival, health and happiness are inextricably dependent on nature. To confront today’s environmental crises, everyone — garage mechanics, construction workers, dentists, politicians and judges — has to see the world through an environmental lens. We’re clever animals — so smart that we think we’re in command. We forget that our inventions have created many crises. Atomic bombs represented an incredible scientific and technological achievement, releasing the power within atoms. But when the United States dropped them on Japan in 1945, scientists didn’t know about radioactive fallout, electromagnetic pulses or the potential for nuclear winter. Those were discovered after we used the weapons. What we need is humility. As clever as we are, nature is far more creative. Over 3.8 billion years, every species has had to evolve ways to find food, water and energy, and to dispose of wastes, find mates, reproduce, avoid predators and fend off parasites and infections. Nature offers myriad solutions that we have yet to discover. If we had the humility to learn from nature, using an approach called “biomimicry,” we would find far more and better solutions. Governments change — along with laws, regulations and priorities. It’s the nature of democracies. In Canada, we’ve seen environmental laws implemented, then weakened or overturned, then strengthened and re-instated. But the basic necessities of health, well-being and life shouldn’t be subject to the shifting agendas of political parties. That’s why Canada should recognize the right to a healthy environment in its Constitution — something 110 countries already do. Acting quickly to implement the recommendations will save lives, prevent illnesses and reduce associated costs. By requiring safe replacements for toxic substances, it will also bolster the green chemistry industry, one of the world’s fastest- growing economic sectors. And it could help drive the impetus for a stand-alone environmental bill of rights. In recognizing environmental rights as human rights, the committee’s recommendations mark a shift in the way we discuss environmental protection. A stand- alone bill would take the concept further. It would put human and environmental health at the centre of decision-making, and ensure consistency and coherence between different environmental laws. It would help institutionalize environmental rights protection within governing bodies, make the process of implementing environmental rights more transparent and assist judges in making informed and consistent decisions in cases when those rights are violated. You can write your member of Parliament, the prime minister and environment and health ministers, using the David Suzuki Foundation’s letter-writing platform at https://action2.davidsuzuki.org/FEBR. German forester Baron Karl von Drais needed a way to inspect tree stands without relying on horses. In June 1817, he built a simple wooden two- wheeler, without pedals, that he called the Laufsmaschine, or “running machine” — although it came to be known as a draisine. His invention led to the first conflicts between cyclists and users of other transportation modes, including pedestrians. Carriage ruts in unpaved roads made manoeuvring on two wheels difficult, and cyclists started riding the brake- less bikes on sidewalks, which led to widespread complaints and bans in some countries, including Germany. Many people were simply opposed to the newfangled devices and their riders. These conflicts diminished popularity of the early two-wheeler. The later pedal-powered penny farthing, with its huge direct-drive front wheel and small back wheel, suffered a similar backlash. But technological advances — such as rear chain drives, ball bearings, pneumatic tires and freewheels — eventually made bicycles a more viable transportation mode. Bikes and their riders still face backlashes — in part because so much urban infrastructure has been dedicated to motorized vehicles and, to some extent, pedestrians, leaving cyclists to compete for space. As civic leaders and citizens gain a better understanding of the benefits of getting people out of private automobiles — reduced pollution and climate-altering emissions, less gridlock and more human- centred urban design among them — municipal governments and supporters are working to create more, safer spaces for cyclists. Many cities, including my hometown of Vancouver, are expanding separated bike lane networks, and some employers and businesses are providing encouragement through better parking and showers for cyclists. The benefits of increased cycling go beyond reducing pollution and greenhouse gas emissions. Riding a bike is good for your physical and mental health. Bicycles can move more people with less space and are far more efficient than cars. Most of the fuel used to power a car is either lost or used to propel the massive vehicle, whereas fuelling a bike’s engine — that’s you — requires only a healthy diet. You can also save a lot of money on fuel, parking, maintenance, insurance and purchase. Costs to society — and taxpayers — are also lower. Bikes are easier than cars on infrastructure such as roads, help reduce health care costs and can alleviate poverty as people spend less on vehicle-related costs. Streets become more human- centred, and businesses along bike lanes can benefit.